Cypress, CA, USA – The multiple award-winning Christie® Boxer is now available in 2K. The new Christie Boxer 30 is built for rental staging applications including concerts, amusement parks, projection mapping, live theater and conventions, as well as permanent installations including museums, planetariums, higher education and houses of worship. Omnidirectional with integrated Near Field Communication (NFC), a preview screen and 1,500-hour lamp-life to 70 percent brightness, the 30,000 lumen Boxer weighs 160 pounds and features 2K imaging with optional upgrade licenses to 4K DLP®. Utilizing the same rigging frame, lenses, lamp modules and projector controls as the Boxer 4K30, the Boxer 30 expands the Boxer family and introduces a resolution upgrade path. Christie Boxer 30 has six mercury lamps housed in two 3-lamp cartridges, Christie TruLife™ electronics and built-in Christie Twist™ so without using external solutions, images can be blended and warped from multiple projectors on both curved and irregular surfaces. Users can monitor the lamp hours and serial numbers through Near Field Communication (NFC) with each lamp – simplifying the effort required to track lamp-life as well as the ability to make fast changeovers so the show goes on without interruption. The Boxer 30 and the entire Boxer family deliver omnidirectional orientation capability for greater installation and placement flexibility. 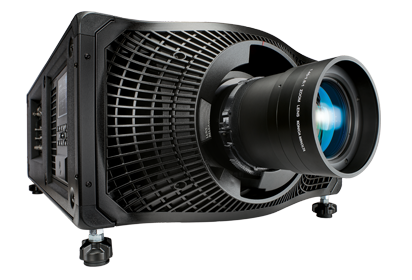 – Up to 2K resolution with 30,000 lumens. – 3GSDI, DisplayPort, HDBaseT, optional DVI, optional HDMI, Optional DisplayPort 1.2 connectivity. – Color LCD preview panel. – Lamp life of 1,500 hours to 70 percent initial brightness. – 3DLP® image quality combined with Christie TruLife™ image processing. – Same rigging frame, lenses, lamp modules and projector controls across the entire Boxer family. The Christie Boxer 30 is now shipping with a three-year parts and labor warranty backed by Christie’s renowned customer service and support.